Yes, I’m enough of a geek that on first weekend the Microsoft Surface was introduced, I found out which local mall had the Surface on display and spent some time testing it. At the time, my impression was that the interface was far too complicated for a tablet and that while Microsoft trumpets the keyboard as an optional accessory, the reality is that it is all about the keyboard. The Surface without a keyboard is like owning a laptop, well, without a keyboard. The Windows RT operating system feels like it assumes you’ll be using the keyboard and the actual shape of the Surface is too long to hold comfortably in portrait mode. To add insult to injury, the first Surface model I was playing with had a problem bringing up the touchscreen keyboard when I disconnected the keyboard cover. The Microsoft representative was baffled why it wouldn’t work and claimed “somebody must have uninstalled the keyboard driver”. Wow. If anyone still doesn’t understand why the iPad is enormously popular, the fact that the iPad will never have a problem like “uninstalling a keyboard driver” should be all the proof required. Early reviews seemed to back up my own testing. The Windows RT (and Windows 8) operating system felt like Microsoft had created a Frankenstein-ed mess, clumsily throwing together concepts from traditional Windows with a brand-new tablet interface. The Surface all together just did not feel like a final, polished product, awkward to use and rough around the edges. It’s been a few months now and unfortunately for Microsoft, the reviews haven’t changed much. I read an article, Sorry Microsoft, I am breaking up with the Surface, that highlighted many of the issues I uncovered. Sorry Microsoft, I am breaking up with the Surface | ZDNetI feel like a failure. Despite investing a lot of hours and effort I can’t make the Surface work for me. It’s not you, it’s me. After too many hours trying to make the Surface fit into my daily work routine, I have placed it on a shelf while I use other devices to go about my business. This is exactly what many of my clients did with older tablet PCs running Windows that were available years before the iPad. They were all excited to get them, and then the reality of the the devices were underwhelming at best. Many of them went unused or relegated to use as a heavy laptop. It looks like Microsoft hasn’t learned their lesson. It’s because I require the gear I use to do everything I need and without fuss. 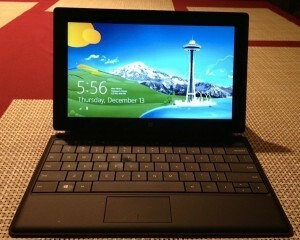 The Surface fails me in this regard despite a big effort on my part to make it work. “Without fuss”. That is exactly what most people expect from their technology devices. Which is exactly what Apple delivers so much better than any other company. Which is exactly why Apple catapulted past Microsoft and everybody else to become the most valuable technology company in the world. Whatever the reason, I am tired of constantly trying to get stuff done with my Surface, only to put it away after a few hours in sheer frustration. I can pick up any other gadget in my possession, and that’s quite a few, and easily get things done with little effort. I am sure some will think I’m too sensitive or that I haven’t given the Surface with Windows 8 enough time. That may be but I’ve given it far more time and effort than I’ve given any other platform and device I’ve used. It’s left me in a continual state of frustration every time I’ve used the Surface to work and I just can’t take it anymore. I think this statement can easily apply to the Old World of Technology in general. Years of suffering with hard-to-use technology left people frustrated. As soon as a viable alternative showed up, people flocked to Apple and haven’t looked back. Microsoft’s Surface is a throwback to those long days of suffering, and I don’t think anyone wants to go back to that.